When Veeam Agent for Linux mounts a backup for file-level restore, Veeam Agent for Linux starts a new backup mount session. To unmount a backup, you need to stop the backup mount session. This may be required, for example, if you want to stop working with files and folders in one backup and mount another backup for file-level restore. You can also stop the backup mount session to unmount a backup after you have finished working with restored files and folders. 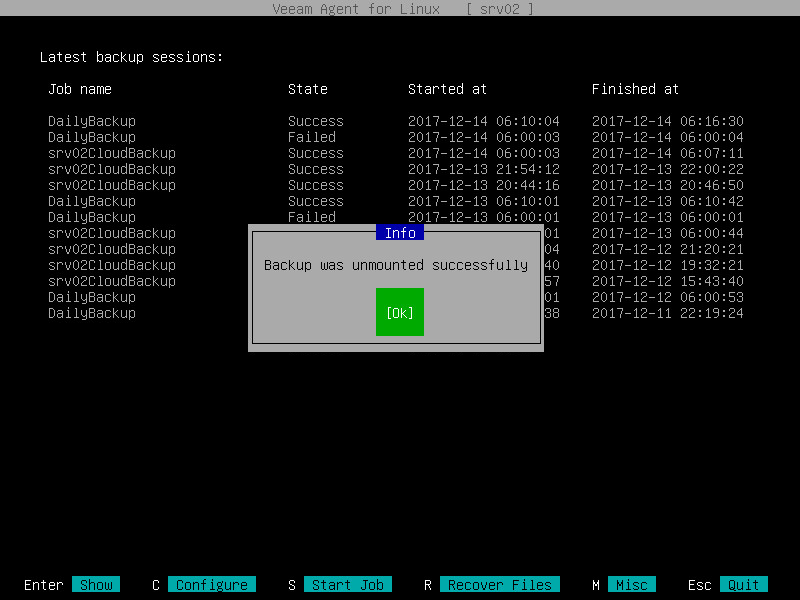 In the Veeam Agent for Linux control panel, press the 'u' key to unmount a backup. Veeam Agent for Linux will stop the backup mount session and display a notification window. Press Enter to close the window and return to the Veeam Agent for Linux control panel.